This surveying compass consists of a wooden base covered with ivory and brass. The upper side has a wind rose and a scale of degrees. 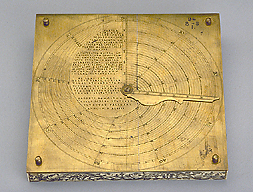 On the brass plate on the back is an ingenious scale, used to compare the distances between two longitude lines, at the equator and at a given latitude.